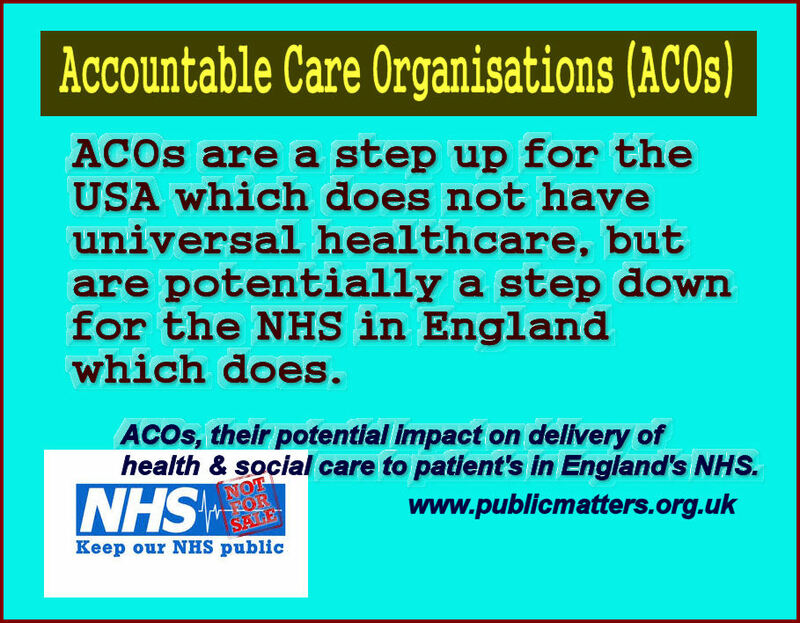 Accountable Care Organisations or ACOs for short are accountable to themselves. 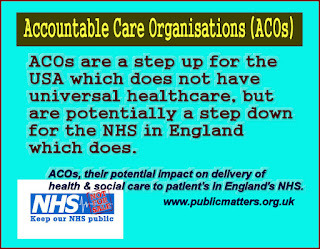 By ACO definition that's what the word 'accountable' means. Each partner in the organisation is responsible for saving money so it can be reinvested back into the partnership organisation. Again, that's a fact, and it's called a capitated payment system. But what else do we know about these ACOs? ■ What they really mean with ACO is American Care Organisation. or Accountable Care Organisation - a USA health insurance model. ■ NHS England is now run by Simon Stevens, ex vice president of European Division of United Health, the largest private health insurer in America. ■ United Health refused to sell fairer health system 'Obamacare' plans to consumers - Obamacare wasn't deemed to be profitable enough. ■ Although not profitable enough for United Health, the ex vice president Simon Stevens wants to sell Obamacare type systems to the NHS in England. Currently named Accountable Care Systems. Apparently these ACOs can save the government £billions, but they do this by denying and rationing care and getting patients on care plans to pay for certain treatments (co-payments) if their income is above a 'fixed' level (the affordable care level in the USA). ■ Clinical Commissioning Groups (CCGs) now act as health insurers and are denying patients treatment based on pre-existing conditions or conditions that do not meet the CCGs financial viability criteria (amongst other restrictive criteria). ■ At public meetings, ALL CCGs in all 44 footprint regions of England have avoided the topics of the new payment system called 'capitated payments' and the new control mechanism known as 'demand management'. The new payment system is a financial incentive profit based on making savings using demand management techniques such as rationing and denying patients treatment and medicines. The fewer people they treat, the more money they save and keep. This is the standard model of US health insurance called Health Maintenance. See google Health Maintenance Organisations and Kaiser Permanente (as promoted by ex health secretary Jeremy Hunt). 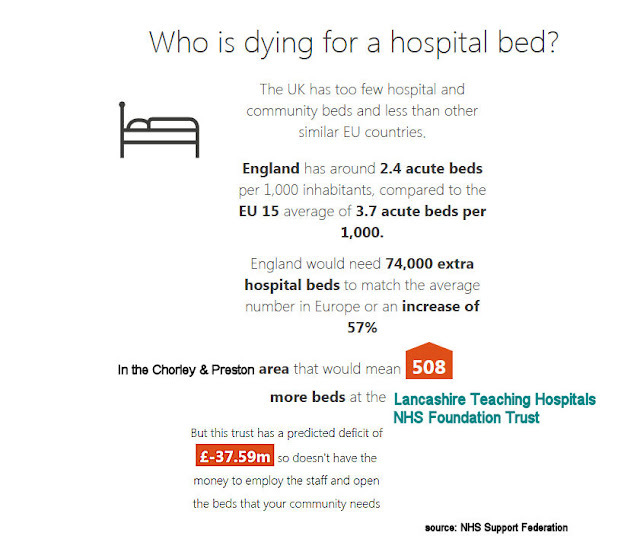 The UK has the least number of Hospital and Community beds than most European countries. 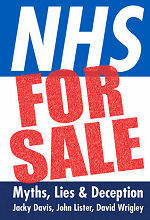 England would need 74,000 extra hospital beds to match the number in Europe or an increase of 57%. This means that Chorley & Preston hospital would need 508 more beds. But the Lancashire Teaching Hospital Trust are £-37.6m in deficit so doesn't have the money to employ the staff and open the beds our community desperately need. This is because over the last 8 years the government have gradually reduced the NHS Tariff and reduced the NHS budget and brought it down to levels well below those not seen since the advent of the NHS in 1948. The current government objective is to remove public NHS health services and replace them altogether with public-private ventures such as ACOs/ACSs. Instead of increasing taxes, they've opted to privatise large chunks of the NHS with the ultimate aim of bringing in American style ACOs under the guise of 'integration'. (1) Removing the NHS internal market and all its buying and selling (commissioning) along with all other administrative burden would free up over £5bn a year for frontline servces. (2) Add 1p on general taxation would bring revenue of over £6bn a year. BUT undertaking (1) and (2) above wouldn't aid bringing in the commercial private-public partnerships and wouldn't completly rid them of the public services they so abhor. So they've chosen to ration treatment, underfund local commissioners and providers, and starve the NHS of resources to get their way [Macro demand management]. You, your parents, your relatives and friends will suffer in the process of the new Accountable Integrated American health system.